The cable supply electricity to the electrical control system of the transfer trolley. Then the operator operates the trolley, such as start, stop, forward and reserve. It has advantages of low noise level, easy operation and maximum safety for operators. Wireless remote control systems and pendant buttons can make operating system adjustable. These carts are widely applied to suit varied jobs and applications. Ellsen line of trolley is used on rail or square bar for the purpose of a definite travel. Electric transfer vehicles are extensively used in painting shops, quarries, warehouse and cross-bay workshops in order to transfer loads in a hassle-free manner. The cable supply electricity to the electrical control system of the transfer trolley. Then the operators operate the trolley, such as start, stop, forward and reverse. The transfer cart can be applied to assembly line for rigging equipment. 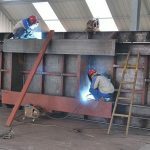 They are also can be used in severe working situation, such as coal and mine industry, painting shops and blasting booth. The transfer cart is feed AC 380V/415V/440V by cable. Through the electrical control system, the cart starts, stops, forward and backward. This type of transfer vehicles can be equipped with hydraulic lifting system for cargoes in order to optimize space as much as possible. The trolley can be operated either by push button pendant or remote control. It is feel electricity via cable, which supplies power to drive control and start, stop the trolley accordingly. Safety facilities: automatic stop when detecting obstacles, limit switch, light alarm and bumper. The transfer trolley is applied in boiler factory, it is used to transfer heavy machine or equipment, for example, boiler or furnace from one location to another in factory. Additional request, sucha s high temperature working environment, also can be satisfied. Usually, our trolley is traveling on track, we can also design trolley running on concrete floor. Our cart can be electric powered, machine towing or manual operate. You can choose storage battery operated, cable reeling drum power or shroud bus bar. Rail flat trolley can be applied on the assembly line include raw material paper bucket transfer, process transfer, finish paper roll store. It is also applied for relative industry such as coil transportation, column object handling. 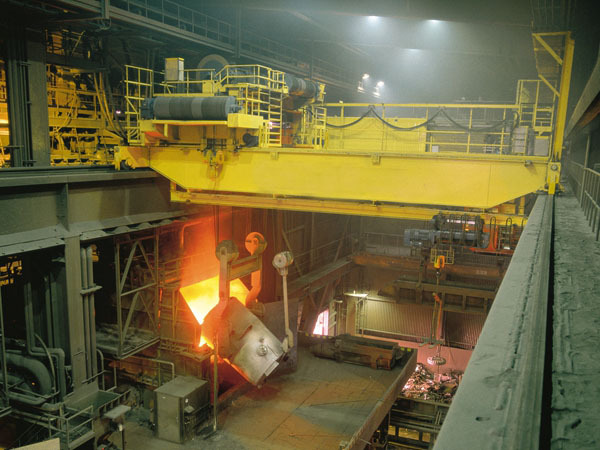 The material handling solution is powered by mobile cable. AC motor drives speed reducer and wheels to make the cart start, stop, go forward, and backward. 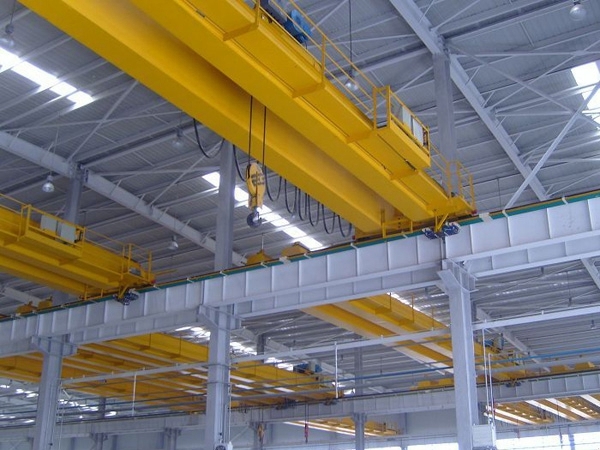 According to customers’ demand, the hydraulic lifting device and hydraulic dumping device can be increased. 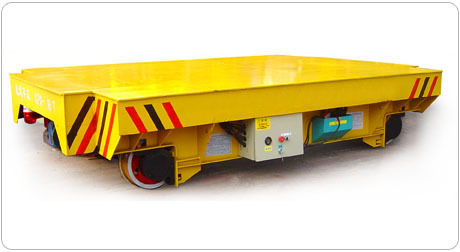 Material handling solution include all kinds of rail transfer carts for factory transportation. It is mainly used for bays and warehouses handling. It is ideal handling tool in modern manufacturing industry and machinery industry. The transfer car is traveling on rails, which is installed in the ground. It is feed power to the gear motor thru cable, then the car is moving forward or backward accordingly. For the electrical parts, especially gearmotor, ABB, SEW, Siements or other brands are available. 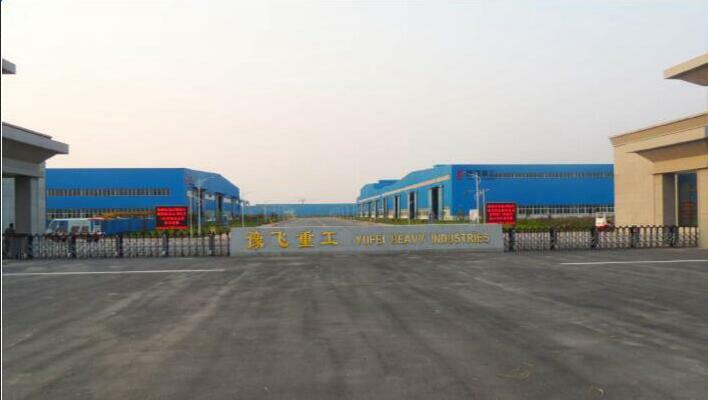 As to the safety equipment, buffer, light alarm, limit switch can be installed. The cart is designed to cater to severe conditions, including high temperature, flammable and explosive environment. 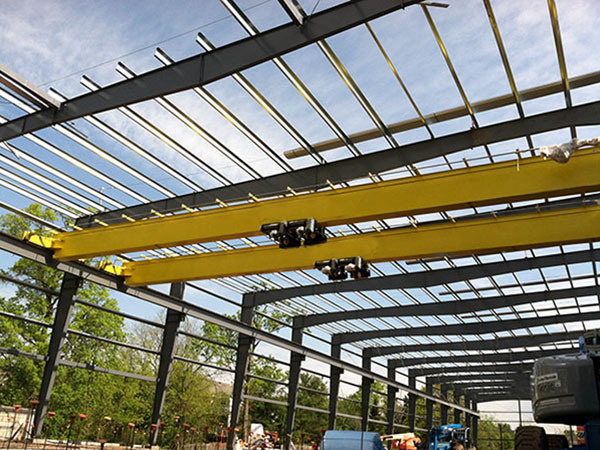 The transfer car is used to transfer material such as mold from one location to another within factory. The carrying ability is up to 300MT. It is also suitable for coal and mine, steel plant, shipbuilding , or at dock. As to the surface, flat decking, V-shaped coil holder, U-shaped decking is available. Conditions: running on straight rails, “S” or curved track, and cement floor. Power source: cable reel, battery, dragging cable, festoon cable, low-voltage rails, shroud bus bar. Rail transport truck gets the power from 380V,415V, 440V AC power. The electricity is passed to the cart by cable winded on cable reel. For more than 50m running distance, we will consider to use the magnetic coupling cable reel and install the guided shelf for cable in order. Hot dip galvanized plant can process cold roll, steel structure, steel tube. Rail transport truck is mainly used for handling the galvanized work-piece from one processing area to another. It can load work-piece and shift for a long distance. Steel scrap handling carriage gets the electricity from cable drum. It adopts magnetic coupling cable reel to realize 200m running distance. 3 phase AC power provides the electricity for metallurgical motor which drive speed reducer and wheel to realize the carriage movement, such as start, stop, forward and backward. Steel scrap handling carriage is used in large scale metallurgy or refining line, especially for steel plant. In order to increase efficiency, we can design weighting system to realize automatic weighting for steel scrap. The transfer car is feed AC 380V/415V/440V by cable. Through the electrical control ssytem, the cart starts, stops, forward and backward. The transfer carts are AC motor driven and suitable for non-stop working and high temperature working environment. The carts can be easily operated, either by radio remote control or push button pendant.